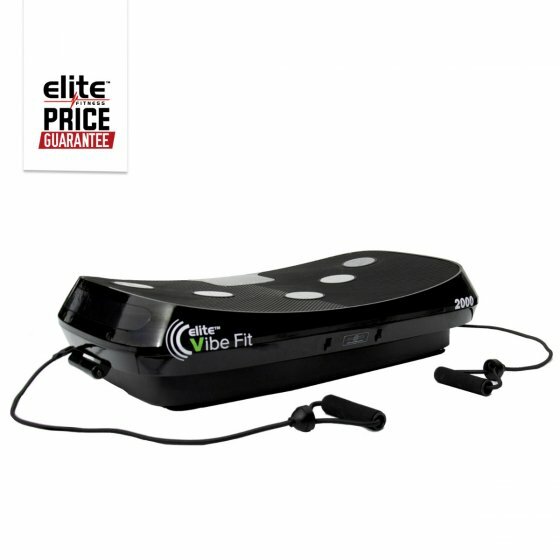 Vibration training delivers an excellent overall body workout in a compact format and the Elite Vibe Fit 2000 is no exception. With 3 modes offering a lateral movement for general conditioning an oscillating movement for circulation and massage benefits and a combination movement which is perfect for balance and neuromuscular improvements the Elite Vibe Fit 2000 stimulates the user's muscular system from all angles generating a well-rounded workout. 30-speed levels ensure the user can always progress to push themselves the Elite Vibe Fit 2000 is an exceptionally versatile vibration machine. For upper body workouts, resistance straps are included to target the shoulders, biceps, triceps, upper back and chest. The wrist remote control provides convenient control over the vibration speed without the need to continually dismount to adjust settings. If you need to improve your fitness, improve your bone density and overall muscle conditioning with the multiple other added benefits including easy portability and compact size then the Elite Vibe Fit 2000 is for you! *Any cost associated with the transportation, travel or freight to, or from, a customer’s premises, is at the customers cost. This means the customer must return the machine to the point of sale, or the closest service centre before any warranty work is undertaken. *In relation to any warranty exceeding 1 year, i.e. frame, motor, electronics or parts, the warranty is for the aforementioned only and excludes labour which will be charged separately after any labour warranty has expired. 3 modes including Lateral Oscillation, massage and swing function.